PPP/C nominated Commis-sioner at the Guyana Elections Commission, Dr. Keshav ‘Bud’ Mangal has come out in defence of axed Chief Election Officer (CEO) Gocool Boodoo and supported the latter’s suggestion that Chairman of the Commission Dr. Steve Surujbally had misused Gecom’s vehicles for a trip. Boodoo’s statement was contained in a letter in Monday’s edition of Stabroek News and in response to allegations that had been printed about him in other sections of the media. Thus far there has been no response from Surujbally or Gecom to Boodoo’s statement. Boodoo was sent packing two weeks ago after Surujbally voted and broke a deadlock between Opposition- and Government-nominated Commissioners on whether a new contract should be offered to the CEO. The vote seems to have brought internal rifts to the fore. Boodoo in the letter on Monday had blamed in part the IT department of Gecom for the results fiasco following the 2011 elections and then levelled various allegations against Surujbally. Mangal in his letter which appears in today’s newspaper explained that on the May 21, 2013 the full Commission took a decision at its 391st Statutory Meeting for each Commissioner to submit their Appraisal of the CEO for discussion and decision. “In view of the foregoing discussions on the matter at hand, the Chairman queried whether the Commissioners preferred to document why Mr. Boodoo’s contract should be renewed or not and the various documents should be reviewed to arrive at a decision. This position was endorsed by Mr. (Vincent) Alexander and accepted by the Commissioners,” he said. “Accordingly, it was agreed that the Commissioners will document and present their respective positions which will be discussed at [a Statutory Meeting] on Tuesday May 28, 2013”, he said. “At meeting of June 11, 2013, my Appraisal was circulated and accepted by all Commissioners including the Chairman for subsequent action,” he said. That appraisal attached to the letter set out numerous reasons why Boodoo should be retained. It however failed to sway the opposition-nominated commissioners and Surujbally. 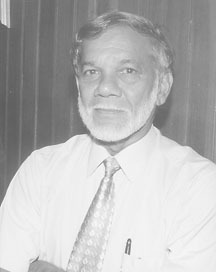 He said that Boodoo and his staff in compiling the final tabulation and allocation of seats – “were all under pressure from the Chairman, Dr. Surujbally and his PRO Vishnu Persaud as they had caused to be assembled at the Pegasus Hotel Media Centre – International Observers, Heads of Commissions, various Media etc. for the CEO’s announcement at 1 o’clock, then 2 o’clock then 3’ o’clock – as we all participated in the process of getting it right to give the Commission’s approval for the announcements.” Boodoo would later present results to the commissioners stating that the PPP/C had gained a parliamentary majority. This was challenged by Alexander who then had an exchange with Boodoo over the calculation. After initially insisting that he was right, Boodoo recalculated the seats allocation and arrived at the correct one which gave the opposition a one-seat majority. In recent weeks, Alexander accused Boodoo of altering the formula for the calculation of seats on the day the results were to be declared and this accusation underpinned the decision of the opposition-appointed commissioners not to renew his contract. “In fact I encountered Dr. Surujbally at the Pirara Ranch House with Gecom’s vehicle as I was also on a trip in the area with family and friends in my own personal vehicle – as guests of Mr. Vic Oditt – owner of Pirara Ranch,” said Dr. Mangal. He also said that the Chairman must tell the nation about the $31 million worth of films provided to a local firm. “The contract was a two-paragraph document in favour of the Company. The whole arrangement was so engineered to protect those involved from accountability by ensuring that no one in authority is answerable,” he said. “We need to know how much money was recovered,” he said. “As Accounting Officer it was my responsibility to ensure that corrective action was taken swiftly and so I wrote him on March 21, 2003. That was the beginning of all the threats to get rid of me. He continued making statements about me with subordinate staff who promptly reported to me what was being discussed at the level of the Secretariat,” said Boodoo. “He has said to me many times that he would not support my renewal of contract whenever it was up for renewal. However, if this is the behaviour of someone who is supposed to have a fair understanding of due process, then the nation must know what to expect,” said Boodoo. Dr. Surujbally was unavailable when this newspaper attempted to speak with him yesterday. However, Stabroek News was informed that a statement in response to Boodoo has been prepared and will be released today in the form of a letter to the editor.